Happy Halloween on this Mish Mash Monday! It's such a fun time of year. 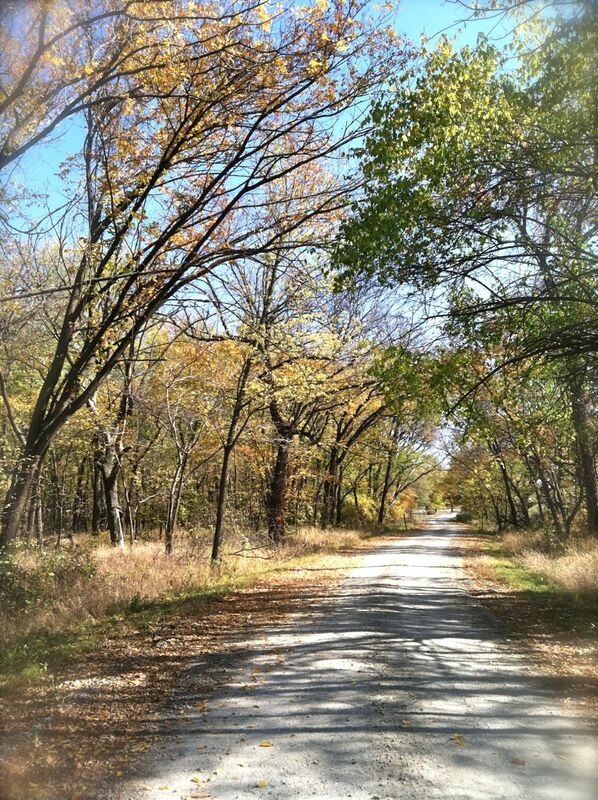 Fall...totally love the changing of the seasons and the earthy colors this time of year. I soak it all up while it lasts because soon enough all the leaves will be gone. The earth will look brown. And Winter will be here soon which means I tend to hibernate inside. Family time......I've been enjoying a little down time just hanging out with the family, organizing some projects to hopefully complete before the end of this year...and having fun with the family. Our weekends are free again since volleyball is over so Jordan and I took an afternoon to get artsy with her oil pastels. 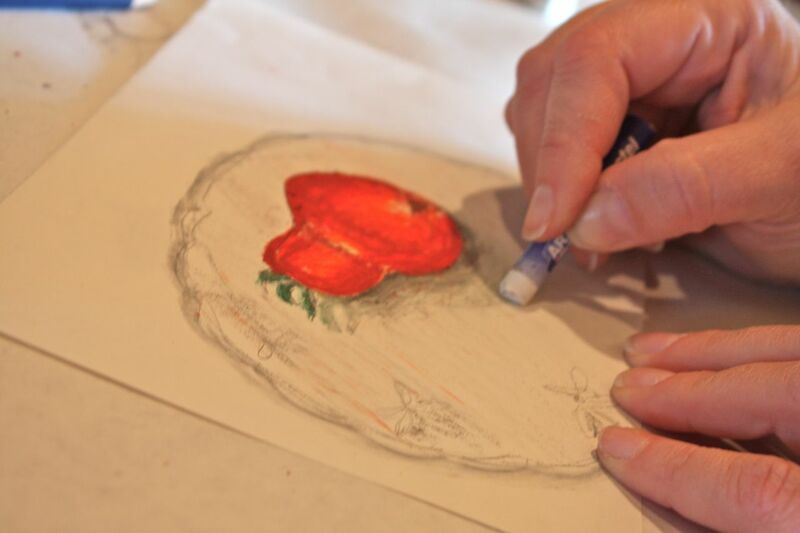 Not my best art medium to work with but we had fun coloring sketching and coloring one of the last tomatoes from the garden. Halloween happenings....A few weekends ago we took the girls and 4 of their friends to the scary haunted houses in a warehouse district in Kansas City. So fun to watch the girls hunch together, arm in arm as they screamed the night away. Of course I wasn't too far behind Eric, holding on to his belt loop the whole time. 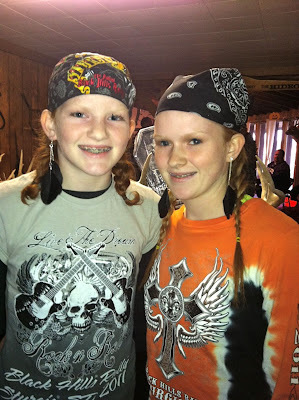 We also spent Saturday night at an annual Halloween party at a nearby hunting lodge that our friends rent for the night. We all went as bikers this year, complete with original t-shirts from the Sturgis bike rally this summer. There was a hayrack ride at dark and then a scavenger hunt after that. Our 2 year winning streak ended this year, much to our dismay. 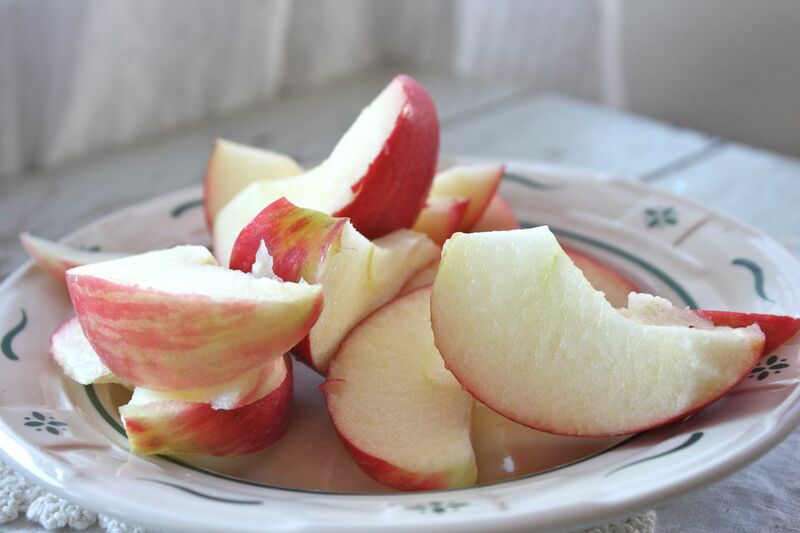 Fall apples....There's nothing like apples in the Fall. My once favorite Jonagold apples have perhaps been replaced by Honey Crisp apples. Oh, they are good. Jordan will be making caramel apples tonight after basketball practice. 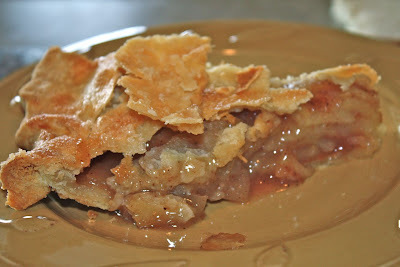 Birthday pie....My dad celebrated his birthday yesterday and I made him an apple pie. 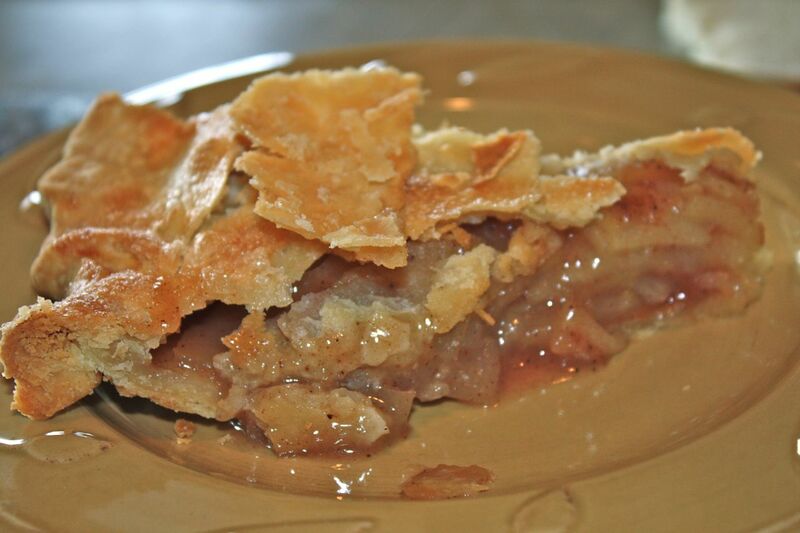 He devoured his piece and said it was seasoned just right with spices and the crust was flaky and perfect. Score one for the baker. He's embarking on another world adventure this month..China for 20 days. I'm so excited for him but we miss him like crazy when he's gone. Stay tuned for a post where I tell you how we surprised my mom with a special gift to use while my dad is away. Holiday Journals.....I'm gathering up all my supplies for my own personal Holiday Journal/Daily December album. I'll be assembling basic pages ahead of time for the entire month of December. Stay tuned for photos of those basic pages soon + some ideas of how to use items from the kit if you purchased one. Edit: I just wanted to clarify that the journals I offered in my Etsy shop are all sold out at this time. The ones from Studio Calico are are still available and if you act fast, Marcy Penner has one of her holiday albums left in her shop here. Enabling....I've fallen victim to a little enabling it seems. 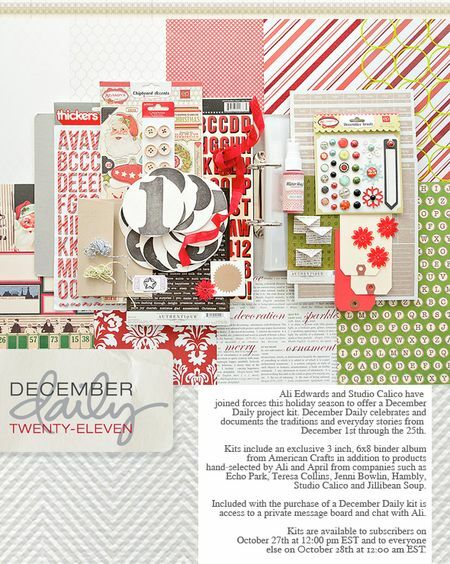 I caved and purchased Ali Edwards' December Daily kit from Studio Calico. After wanting to add a few alphabets, some overlays, etc to my own kit, I took the plunge and ordered the whole darn thing. Noel Notions.....There are still a handful of items in my Etsy shop and I'll be adding a few more items tomorrow morning. Project Life....I counted up how many weeks I am behind. Let's just say lots. The summer months just got away from me because of our busy schedule. But I can happily say that I have each photo slot filled and I'm diligently whittling down the weeks. This weekend alone I've completed 5 weeks. My goal is to complete all the weeks for 2011 by the end of this year. 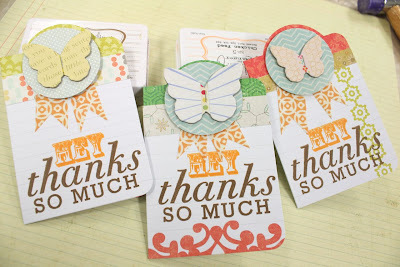 Edited on 10-26-11.....Thank you so much for your orders of my Noel Notions + other shop items. I've updated the items below with sold out status notations. For those of you that ordered multiple times to make sure you got items before they sold out, I will definitely package up all your items together, combine shipping costs and refund any excessive amounts back to your PayPal account. These Noel Notions can be used to embellish all of your holiday crafting projects. 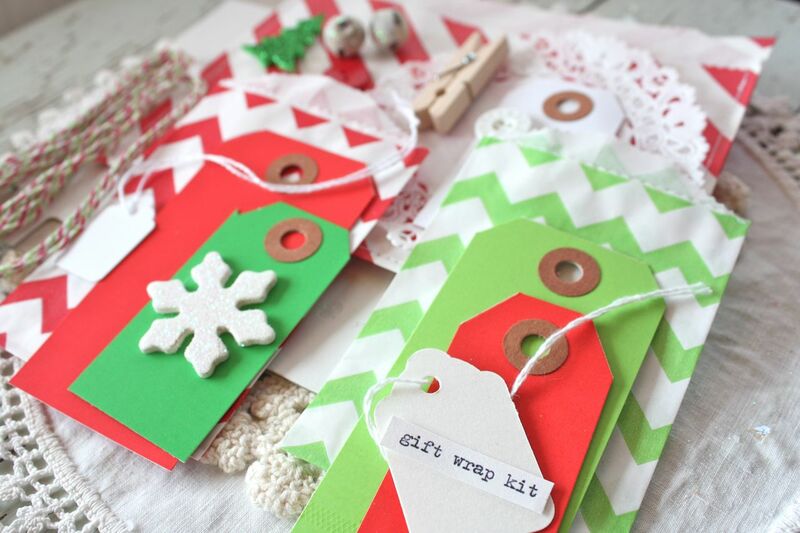 Each year I create new items that I want to use on my own holiday projects...and this year I'm sharing them with all of you. *All Noel Notions will be offered in limited quantities. A few of the items will be offered in batches at different times...others will be a one time listing. I will update this post with the definite *sold out* items. 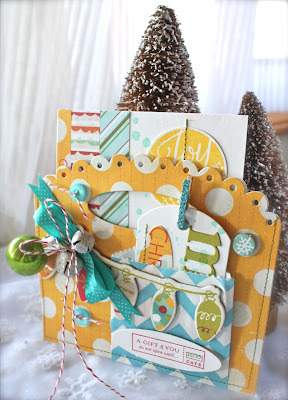 *Sample projects of my own holiday cards, gift wraps and other items will be posted on my blog throughout the holiday season. *There will be no pre-orders on Noel Notions items this go around, sorry. *Noel Notions will be listed in my Etsy shop starting at 1:00pm Central Time on Wednesday, October 26th (tomorrow). *Quantities of each items and full photos will be listed with each individual Noel Notions listing. Feel free to send me an Etsy conversation or leave a comment here if you have questions in the meantime. *More Chevron Bags, Small Blue + Gray Grid & Notebook Bags, Large Notebook Paper Bags + Kraft Striped and Dot Bags will be offered in the shop as well, after the Noel Notions go up. *If you need more quantities of regular shop items, leave a message in the comments section of your order. I usually have more of the everyday products in stock if needed. I will be happy to add items onto your order and then give a partial refund on shipping. *I have a few more Noel Notions items in the works that I did not get completed. Those will go up in perhaps a week or so. *If you make an item with my Noel Notions, please feel free to leave me a link in the comments section. I would love to see your lovely creations. 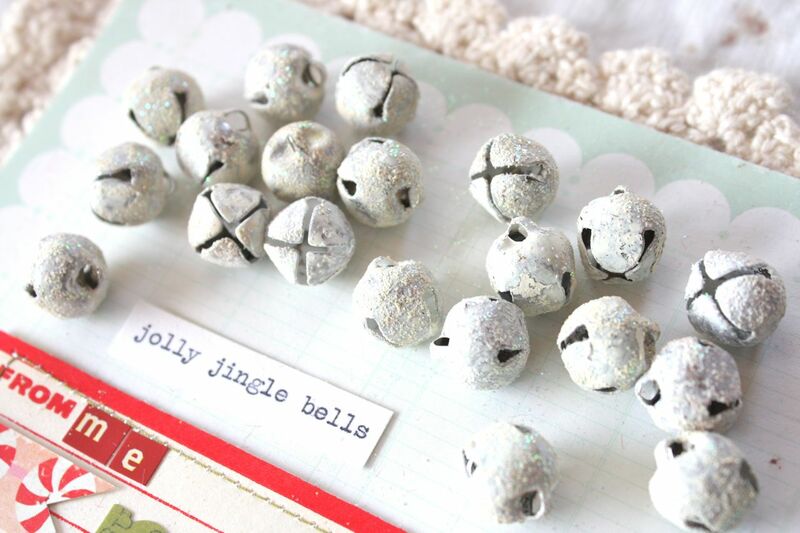 Enjoy and Happy Holiday Crafting! 'Tis the season for my much anticipated Holiday Planners. When the holiday season rolls around, all of my friends and family look forward to their Holiday Planner so that they can begin jotting down gift ideas, recipes, long to do lists and more. I like to hand out the Holiday Planners at least by November 1st and this year I'm adding in a few other items to make a perfect "re-gift". 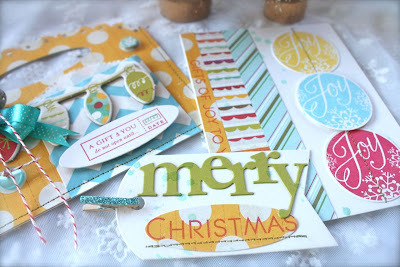 Here's a little shot of the merry little mess I created down in the Craft Department. 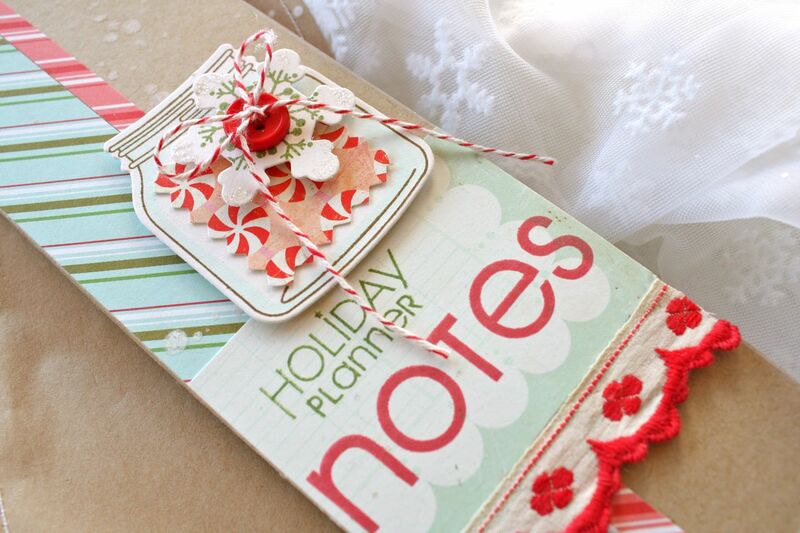 Every year I love to use a simple red and white color scheme for the holidays. Sometimes I leave it at that....and other times like this year, I'm adding in some aquas and greens to the mix. I'm also going with a candy cane stripe as you can see in the patterned papers and twine in my photo below. The time is critical here for handing these out. I plan to give mine out by November 1st. 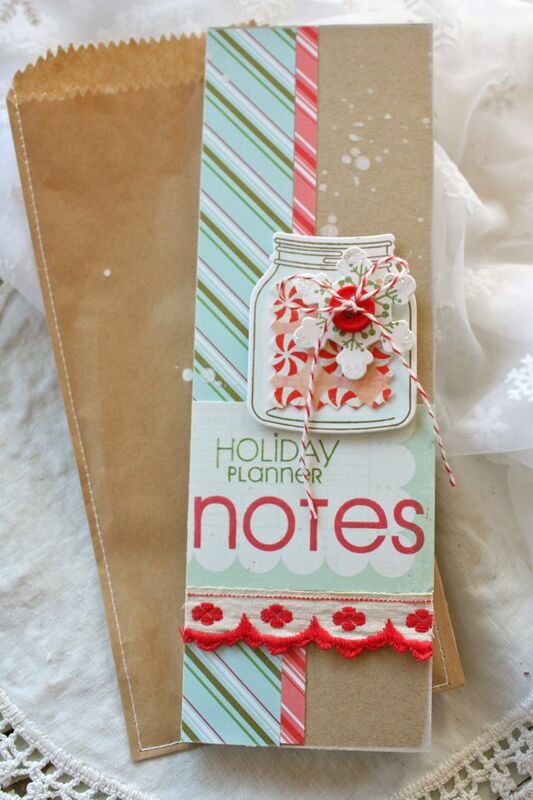 This way the recipient can start using their Holiday Planner & other items. 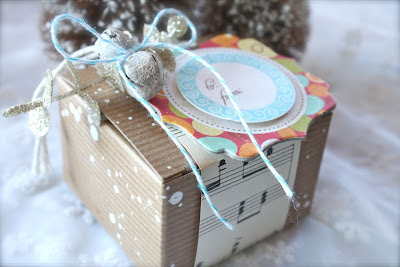 It's also a nice way to give a little gift to someone you don't buy something big or expensive for. And it's great to get together with the recipient early in the season before all the hustle and bustle starts. For the Holiday Planner I used 2 White Notepads so that the notebook will be thicker and last a little longer through the holiday season. All jar embellishments use the smaller friendship jar from the Friendship Jar Summer Fillers stamp set. 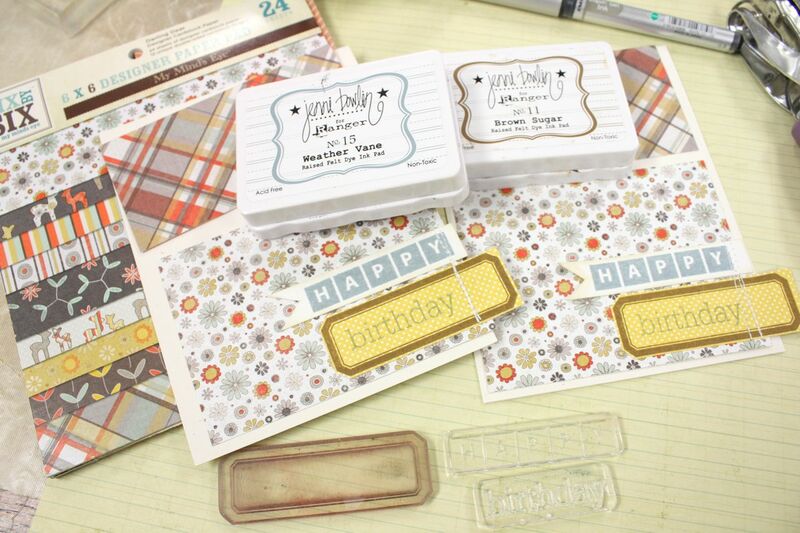 The Pint Jar die is sold separately and makes mass producing these projects a breeze. 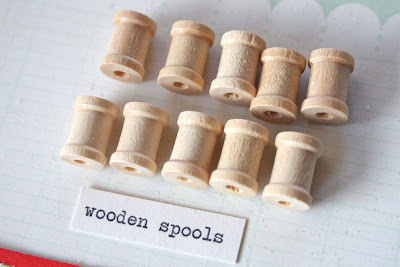 I created 5 total jar embellishments and then started the projects from there. I colored each jar with a Copic marker, just around the edges. 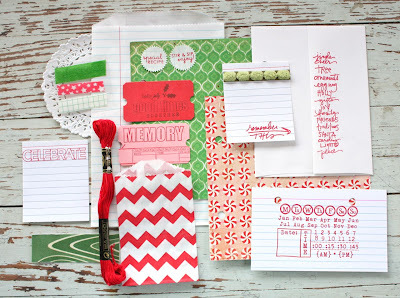 The pinked paper is from Crate Paper's Peppermint line. 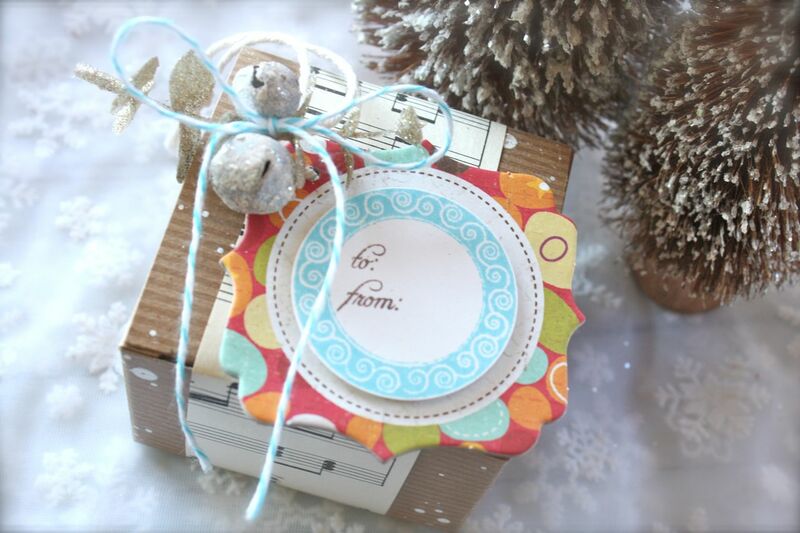 The snowflake die is from the Peace Be Still Collection. Snowflake stamp is from In the Meadow. 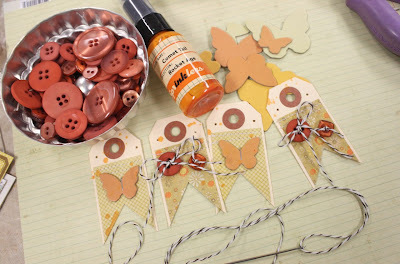 Pure Poppy Vintage Buttons and Red Baker's Twine are from the PTI store. For the sentiments, I used Take Note. It's still a favorite set of mine that Nichole designed from my concept sketches. Paper is from Crate Paper's Peppermint Collection. Vintage ribbon is from my stash. Here's what the inside of the Holiday Planners look like. 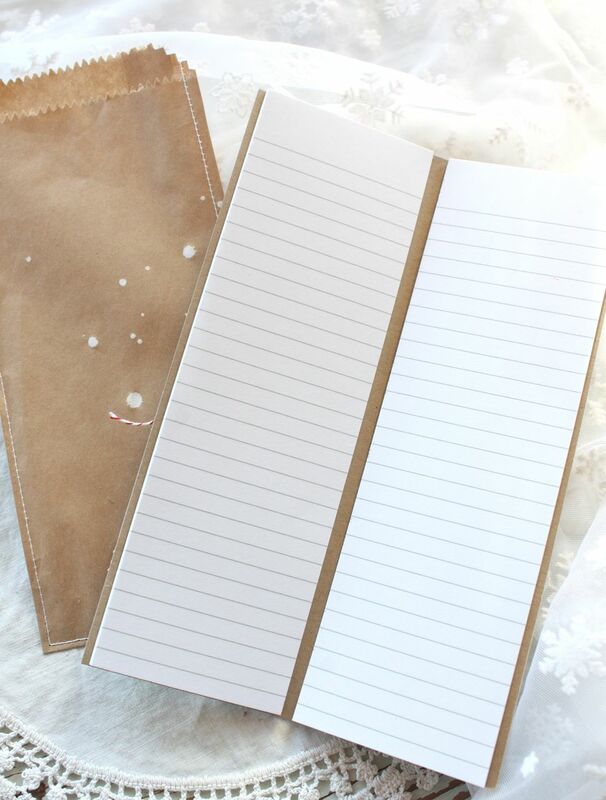 I use Scor-Tape to adhere the notebooks to the cardstock cover. Note: I do not have measurements for the cutting and scoring for the notebooks. I mark where I want to cut & score with my fingernail. The measurements are so small that they never turn out right when I go by a set number. I just make sure to add a little extra to the cardstock cover so that it fully covers the notebooks. For the notebook enclosure, I used a brown paper sack from my shop that I trimmed down and stitched around. Here are the pair of cards. 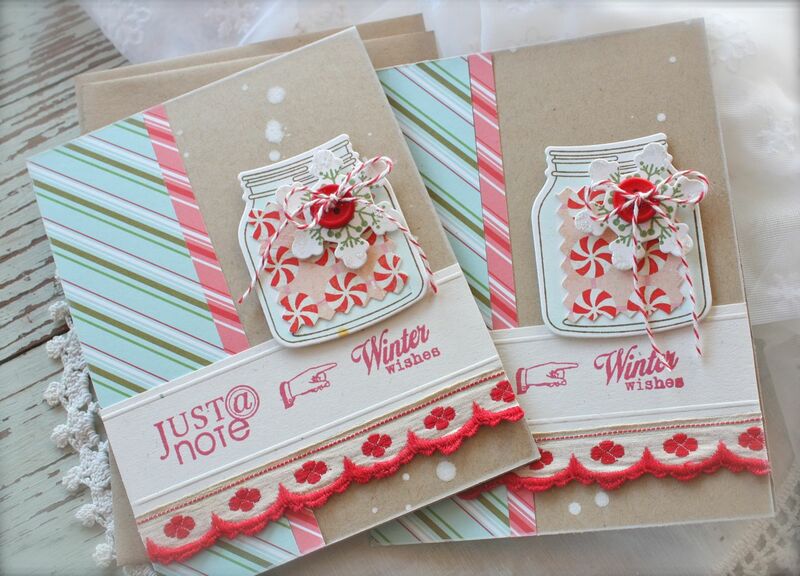 Same concept for the jar embellishment and patterned papers. 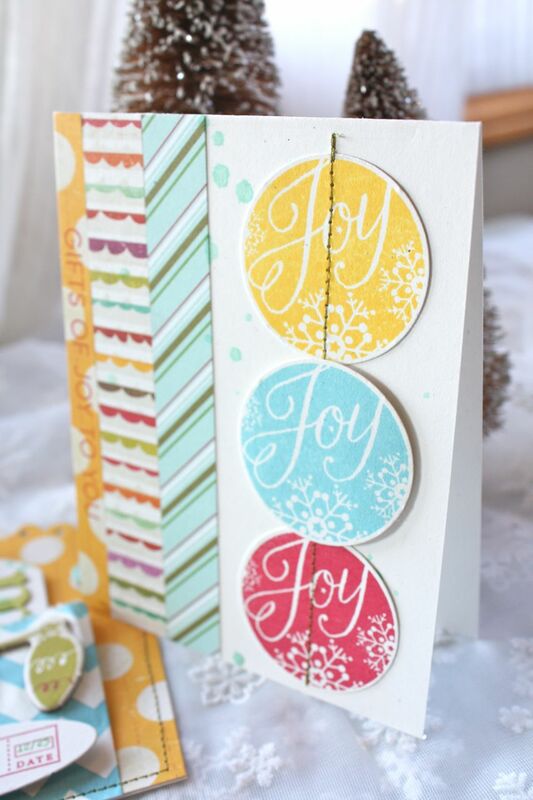 For the sentiment strip, I used my Scor-Pal to create 2 raised lines on the top and bottom of the strip. That just adds a little dimension without the addition of more papers, inks, etc. These cards could easily be used as Christmas cards, thank you cards or well into the winter months of next January, February, etc. The *just a note * and hand are from Take Note. The *Winter wishes* is from Friendship Jar Holiday Fillers. 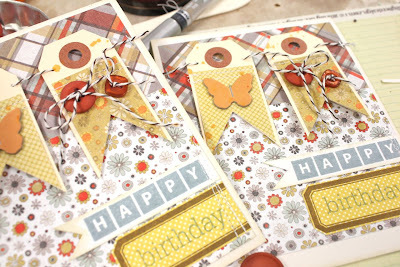 Here are a duo of tags that are made with the new Tag Sale #5 die. It's a new favorite of mine too. The sentiment is from Friendship Jar Holiday Fillers. Red chevron sacks are from my shop. 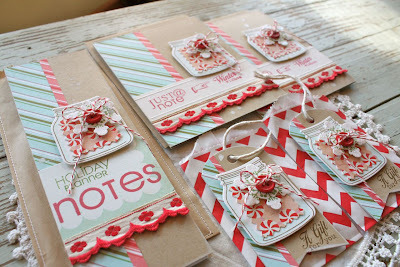 And there ya have it, a fun little ensemble that will surely put the recipient in the holiday spirit. The perfect re-gift! Hope you enjoy! Note: You can click on the *Notebooks* label at the end of this post to see all my previous blog posts featuring my notebook creations. 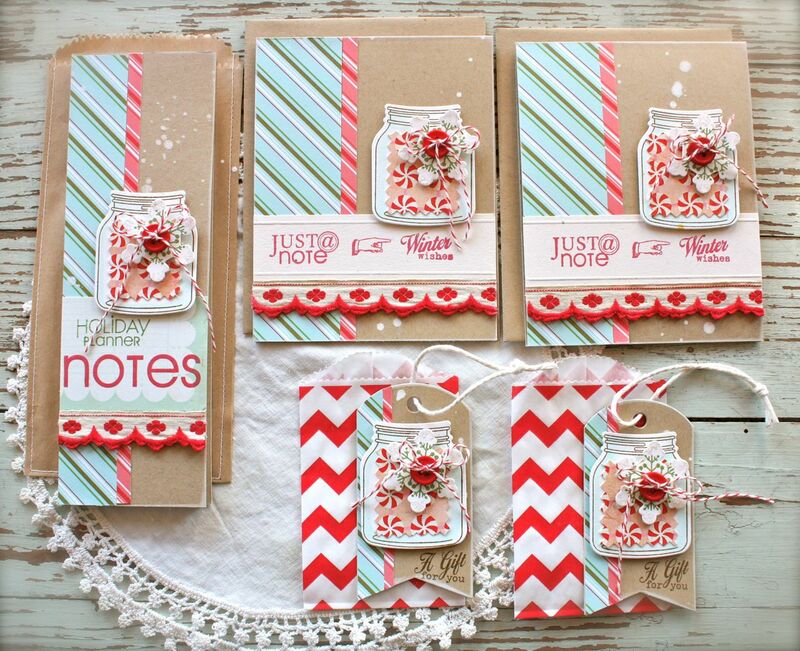 *The Holiday Journals are now sold out for this holiday season. Thank you to everyone who placed an order. *Shipping of the journals will start this week and all orders will be shipped by early next week. *Stay tuned for upcoming Holiday Journal blog posts starting in November. I'll be showing a few journal assembly ideas, some page layout ideas and more. *Many of you have been asking if The 12 Days of Christmas will take place this year. 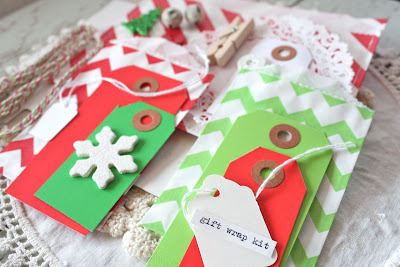 This was a blog event that Melissa Phillips and I did together last year where we presented holiday projects and recipes. Melissa and I have decided that we will not be doing this blog event this year. For me personally, I'm looking forward to a relaxing holiday this year with my family. 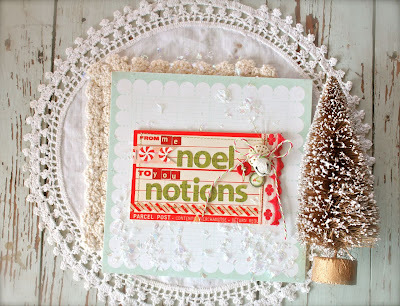 *I've been busy stockpiling my NOEL Notions that I've been creating. Special handmade holiday items such as the frosted jingle bells you've all been asking about, my much anticipated Holiday Planners, homespun candy cane kits, tag kits, glittered clothespins and more will be added to my Etsy shop very soon. 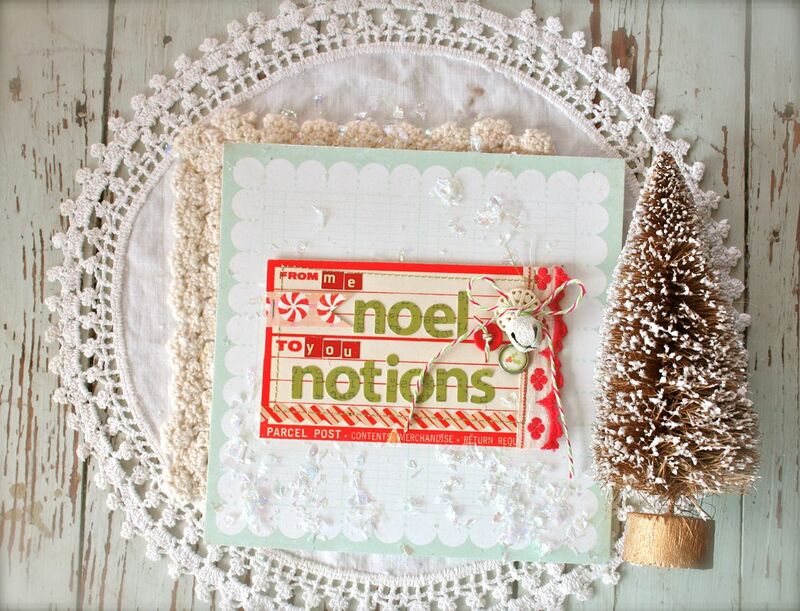 *NOEL Notions will be offered in very limited quantities through the early part of November. *Look for updates on my blog, Facebook Page and on Twitter. *I've had lots of questions about how I do my Project Life album. Do I add photos daily, weekly......do I design the inserts in advance.....what is my process....do I use my iPhone camera or regular camera? I'm happy to share my Project Life ideas with you. I'll try to address a few of these questions with each Project Life update I do. Please leave me questions in my comments section at any time. 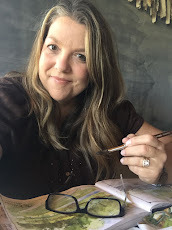 *Lisa Truesdell is another Project Lifer whose work I admire. She is going to be doing a blog post about her Project Life process in the near future so be sure to tune in to her blog. She has a fantastic outline of what she'll be covering in this post. I can't wait to read her post and I'm sure her tips and tricks will be most helpful when going about your Project Life album. *Off to finish up some work....and put socks on. It's freezing here today! Hi there, I'm back today with a few Fall birthday cards. Lots of October birthdays in my family so it's been fun gettin' crafty this month. 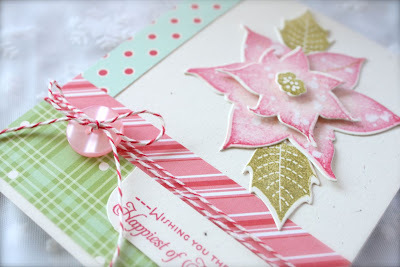 My cards today were inspired by a scrapbook page by Keisha Campbell. You can view the page here at Keisha's blog. 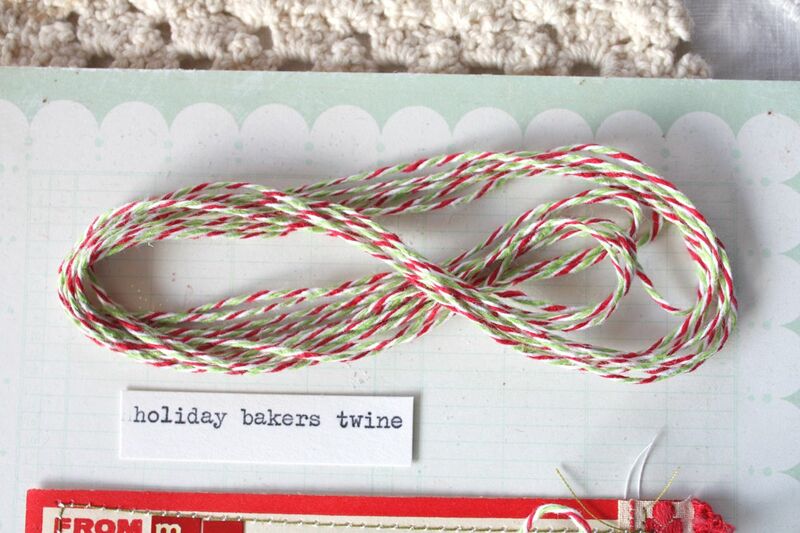 I was particularly inspired by the clever use of her little banner she created with manila tags and baker's twine. So off to work I went. Be sure to stay a while at Keisha's blog, she does amazing work. Thank you for the inspiration, K.
Here are my two completed birthday cards, I just love the Fall color palette. I started off by creating the tags for the card banners. All of my papers I used today are from a 6 x 6 pad of My Mind's Eye patterned paper....Darling Deer I believe it's called. I added some pieces to Small Manila Tags, splattered with October Afternoon Sprinkler spray mist and then cut the tags into flags. The tags were topped with Studio Calico chipboard butterflies and tied with Vintage Buttons in Terracotta Tile. I used Chocolate Baker's Twine for the buttons and to create the garland. For the card bases, I used Rustic White and more of the MME patterned paper. Using Papertrey's Birthday Bash Sentiments I made two separate pieces for the sentiments. 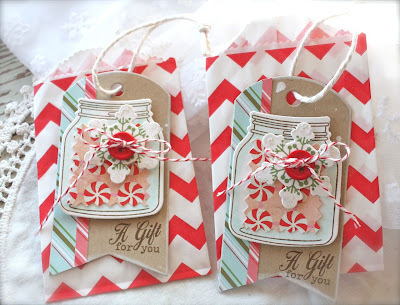 One was stamped on scrap paper that I notched with scissors and the other was stamped onto a Label Basics shape. You can see below that I stitched all the sentiment pieces to my cardstock piece before I adhered it to the card front. This way, no stitching shows on the inside of the card. So happy to have a few more cards crossed off the list this month. Edit: Soup recipe is here. Sandwich recipe here. Happy Monday. 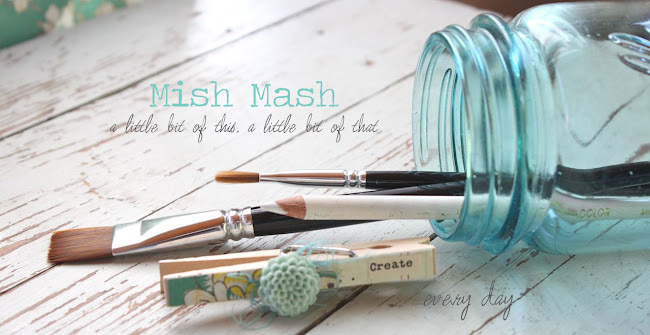 Did you think I forgot about Mish Mash Monday? Well...I kinda did. Not really but the reds had orthodontist appointments today so my time was occupied as the taxi driver. Volleyball....Both the girls had volleyball tournaments this weekend. Way far apart so we could only make it to one event. We went to Jordan's tournament since it was her last junior high volleyball event. She played awesome. There were several matches where Jordan got up to 8 or 9 serves in a row before the team lost the volley. 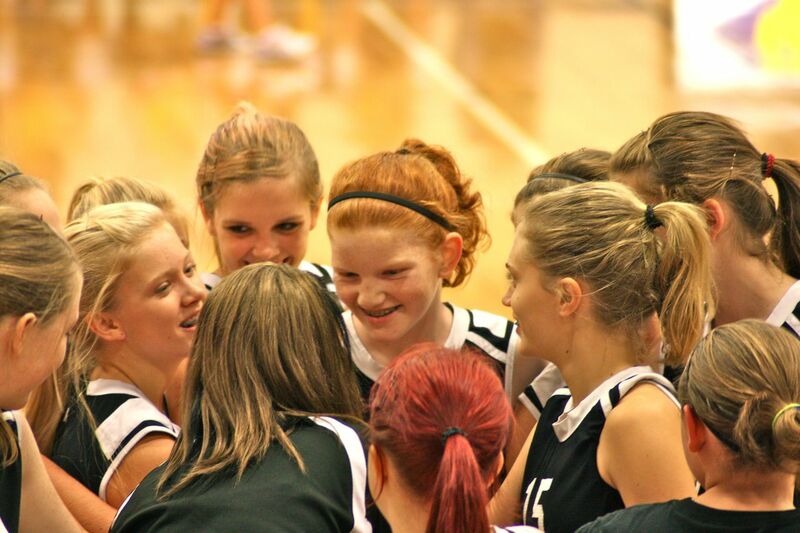 Here she is surrounded by her coach and teammates at a time out the other team took to break her serve. What a joy it is a parent to see your child happy out there on the court. Way to go Jordo! Fall...A cold front is coming through Kansas this week and we may even have freezing temperatures. 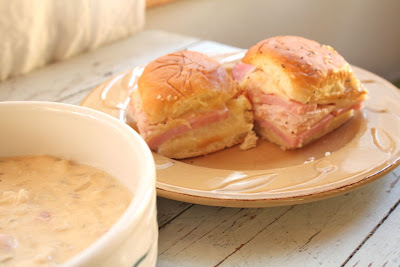 Just in time, I fixed soup & sandwiches for the family we had visiting this weekend. I'm definitely not ready for the cold temperatures. If it gets below 50 degrees, it's Winter to me. However, I do like what Winter brings....warm, toasty fires + soft quilts + lots of books to catch up on, etc. 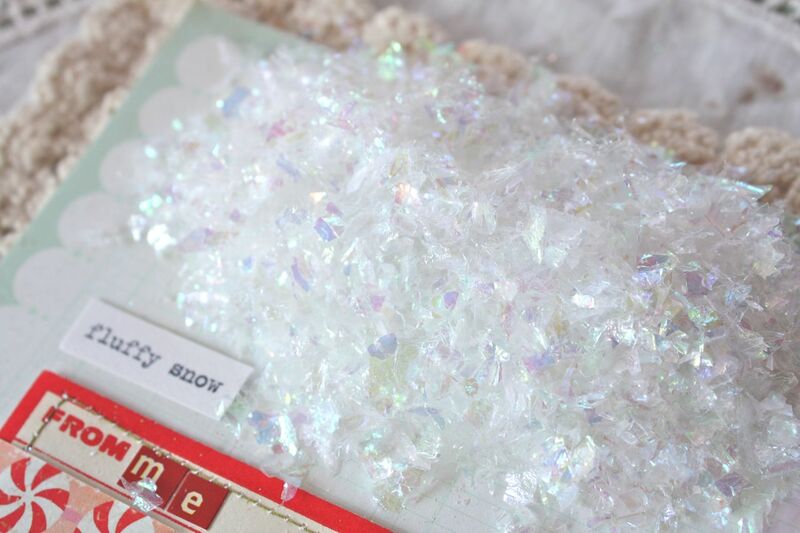 Crafting....Let's not forget the crafting, card making + scrapbooking. 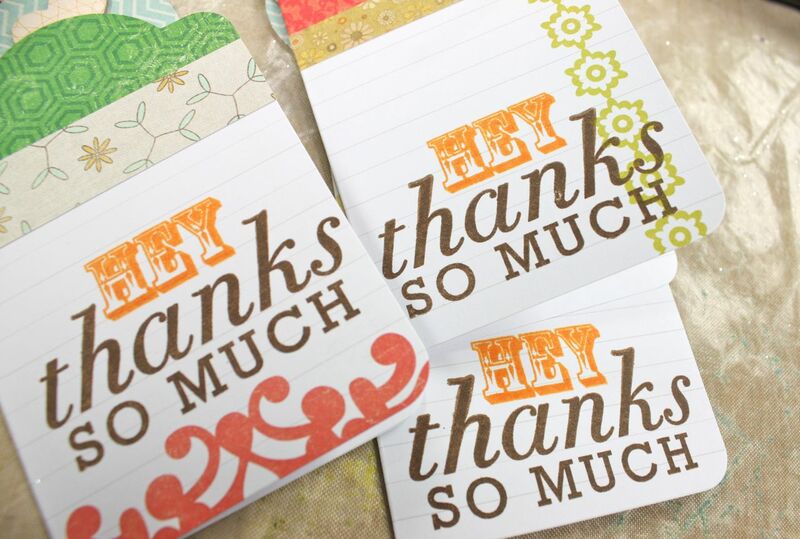 I've been having fun making cards from leftover products from my Project Life pages. 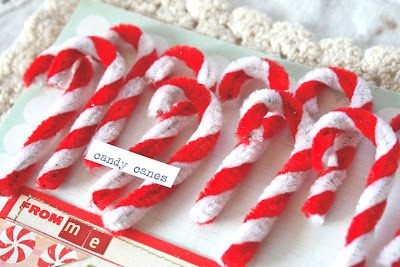 Today's samplings are from this week's Project Life. 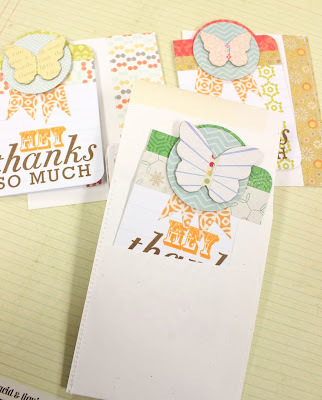 Click the *leftovers* label at the end of this post for more cards made from PL leftover supplies. How about a little tutorial today to get the creative juices flowing? These are a few of my leftover supplies + I grabbed a few of the folded journaling cards from my Project Life Amber kit. Jordan still needs to send out thank you notes for her birthday presents so I decided to create 3 cards for her friends that came to her b-day party. 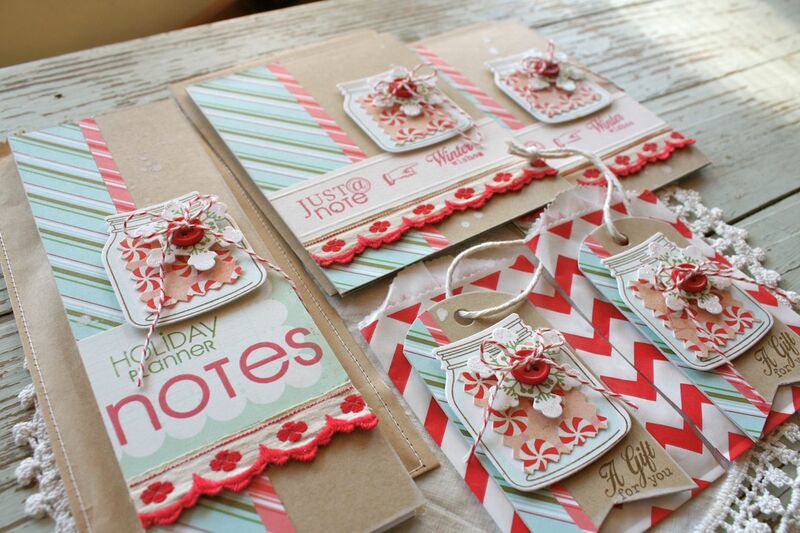 First, fold the cards in half and add strips of patterned paper to the card fronts. Using leftover Studio Calico Fabrips, cut little flags. 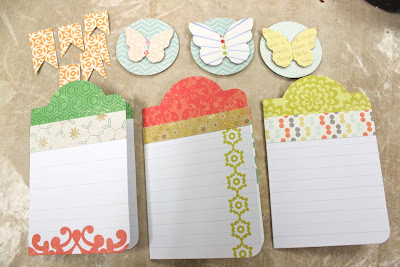 Punch circles from leftover patterned paper and staple on Studio Calico chipboard butterflies. These were a new item that got stacked on top of my leftover supplies. 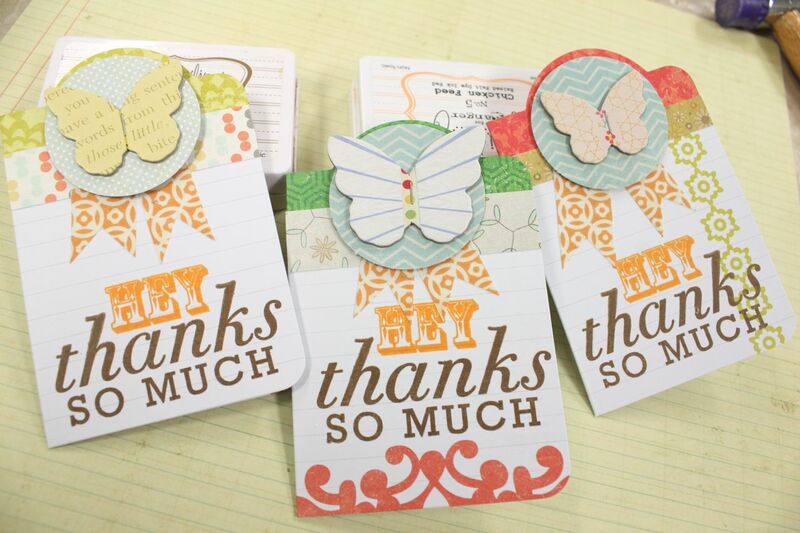 Stamp sentiments on card fronts. I used Papertrey's Say It With Style and Think Big Favorites #1. Adhere the fabric flags under the circles. 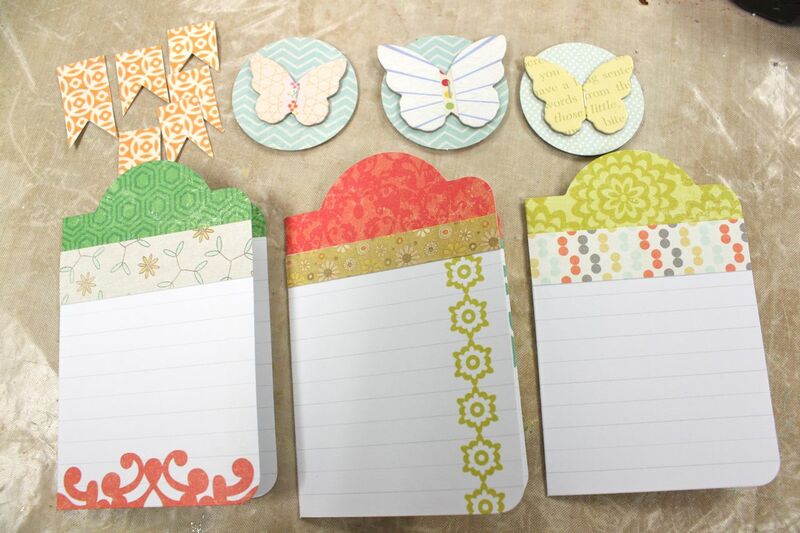 Adhere circles with pop dots to nestle inside the rounded tops of the journaling cards. And presto, a cute little set of cards. 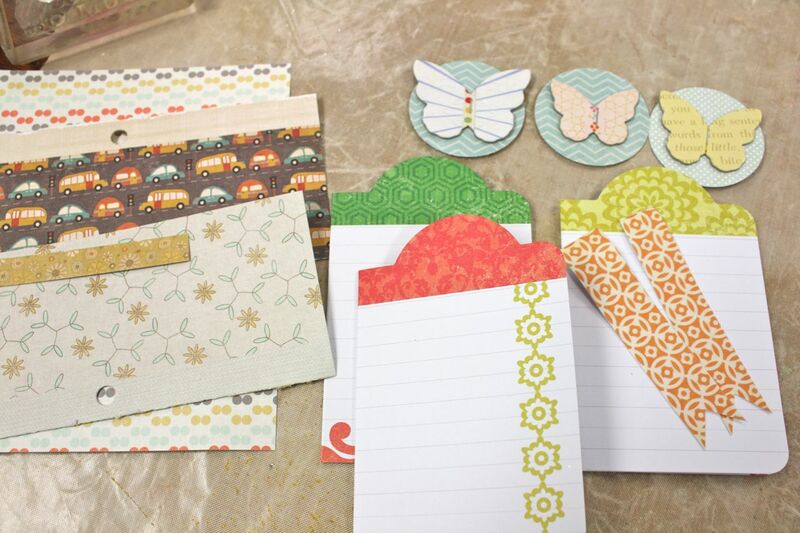 For envelopes, use Papertrey's A2 Rustic White envelopes cut down to 3-1/2" wide. 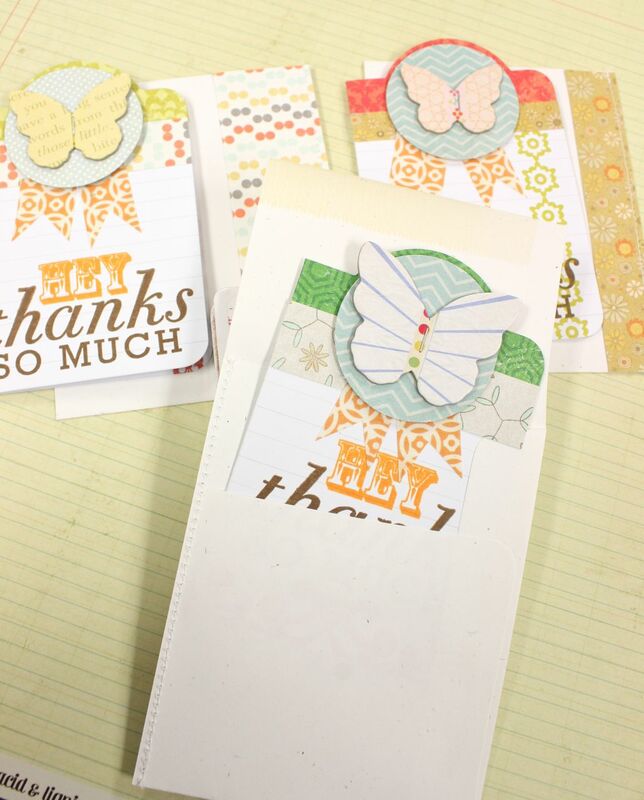 Adhere a strip of patterned paper that matches each card to the front. 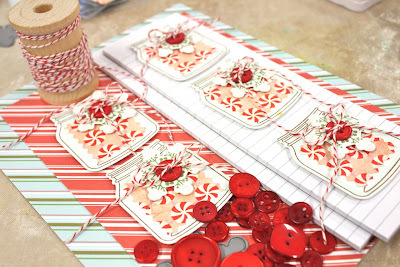 Stitch down the side to create a small envelope. Seal as usual. Fun, colorful, fast. That's what it's all about. Enjoy! Well, I'm off to greet Jordan after school. Now that volleyball is over, she has just a few days off before basketball starts on Thursday. Not much time but I know she'll enjoy playing with her iPad, getting homework done early and just relaxing. Maybe we'll sew on her quilt a little too. :) Thanks for stopping by! 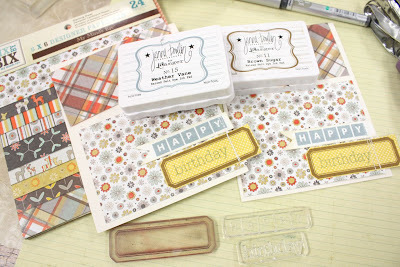 Papertrey October 2011 Release Projects..
Edit: The white spray mist that I used is from Studio Calico. The white is unfortunately being retired.....however October Afternoon makes a white version of their mists also. You could also dilute some acrylic craft paint (in the little bottles from Walmart or any craft store) with water and splatter on with an old toothbrush. Edit: Yvonne asked what I usually give for gifts that I package in the Kraft boxes. Typically it's a homemade treat like a stack of cookies, homemade truffles...or sometimes just store bought candies like truffles. They make great little teacher treats, bus driver gifts, etc. :) If I think of anything else, I'll post here on the blog. Your suggestions are certainly welcome too. 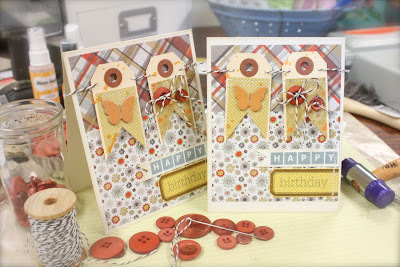 Hi there, back today to show you some of my gallery projects from this month's Papertrey release. We spent a busy Saturday at both of the girls' volleyball tournaments then made a trip to the city for new basketball shoes, a trip to Michael's and out to eat for our anniversary. A great time with my little family. Here we go for the projects. First up is cheery holiday card featuring Christmas Poinsettia. I created the variegated flowers by first stamping the flower in Sweet Blush and then tipping the edges with Pure Poppy ink. I then misted the flowers with Studio Calico white spray ink. 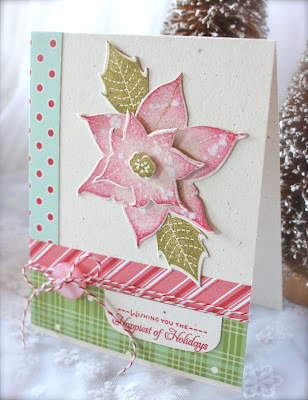 The inspiration for my poinsettia was from this pin in my Pinterest boards. Patterned papers are the Candy Cane Prints and others from October Afternoon. Love the dimension that you get from the layered dies. 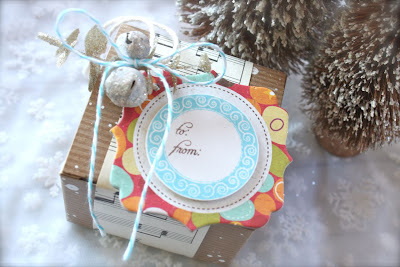 Next up I have a small Kraft gift box that I embellished with Pine's Tag-its #9 stamp set. I stamped the tag, punched it with a 1-3/4" circle punch then popped it up on a Crate Paper chipboard piece. For all of my holiday packaging this year, I'm using Kraft boxes, bags and wraps with bundles of sprigs, jingle bells, ribbons and more. 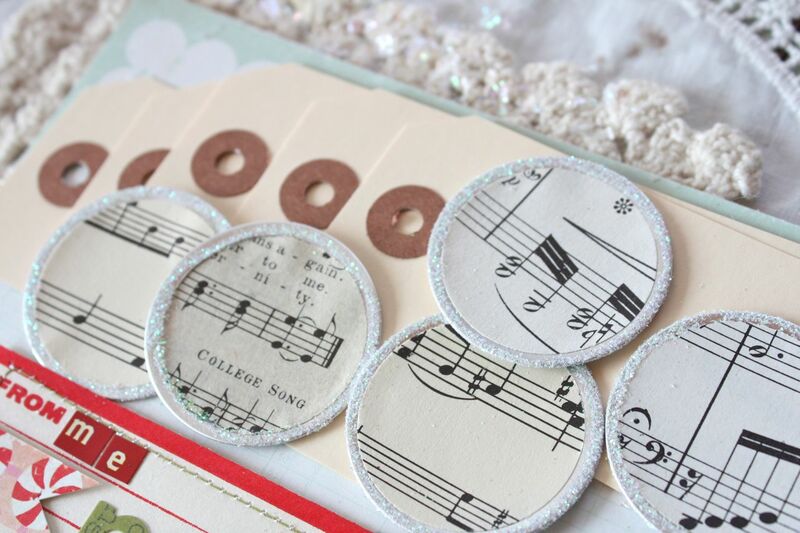 Each piece will also be wrapped with sheet music, old book paper, newspaper, etc. 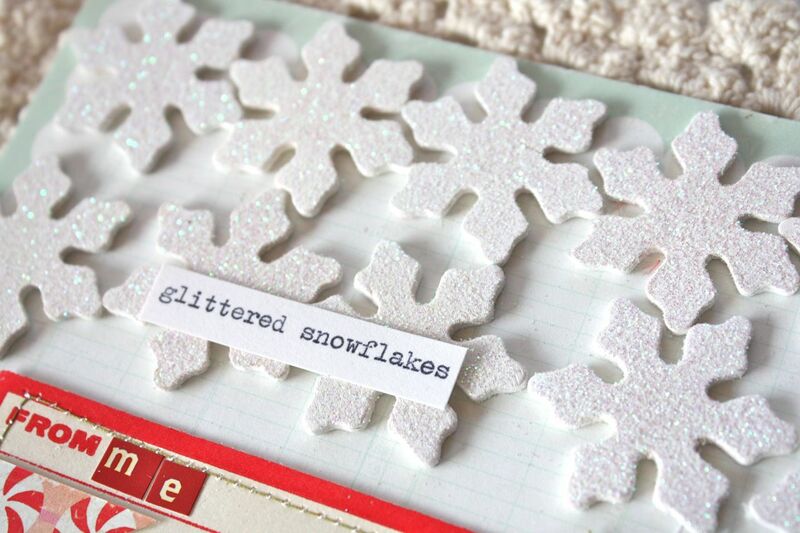 I sprayed the boxes with more white mist to resemble snow flakes. 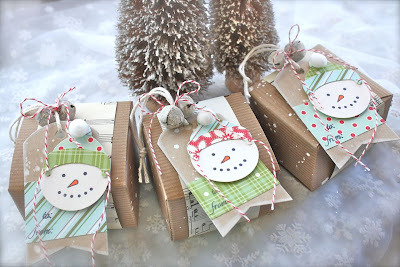 Here I have another series of embellished boxes that use the Shape Up Snowman Accessories stamp set. Each little snowman face was layered onto a Kraft Tag Sale #5 die that has a layer of patterned paper. 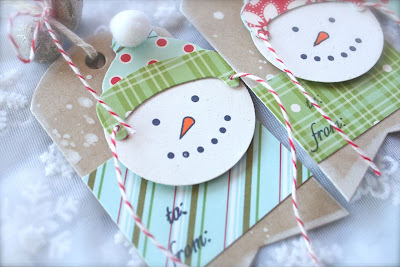 I used a 1-3/4" circle punch to create the snowman faces. Hats were paper pieced using the coordinating Shape-Up Series: Snowman Die Collection. My favorite part....the red and white twine that I used to make the ties for the stocking caps. 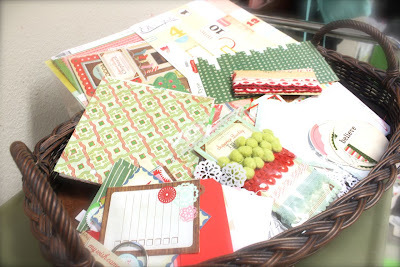 Papertrey release projects: I'll be posting more of my projects from my gallery this week. 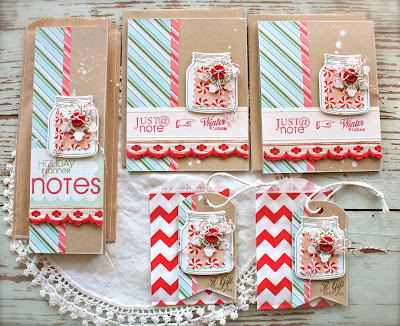 Holiday Journal Kits-These are now sold out in the shop and I'm almost ready to ship them out. Stay tuned for more blog posts on how to assemble your kits and ideas for some of the kit contents. Bags-More of the Chevron, notebook paper, grid paper and Kraft polka dot and striped bags will be listed in my Etsy shop this week. Edited for questions: Yes, the Front and Center die does fit through the Cuttlebug. It's sized just large enough to fit through. The vintage jingle bells I use on my projects are hand made by me. I will be offering them up in my Etsy shop under my Noel Notions creations very soon. Today I'm mixing it up with a whimsical project created for Papertrey's second Group Post for this month. The team is featuring 2011 Holiday Tags and Wonderful Words: Holidays + the coordinating word dies. 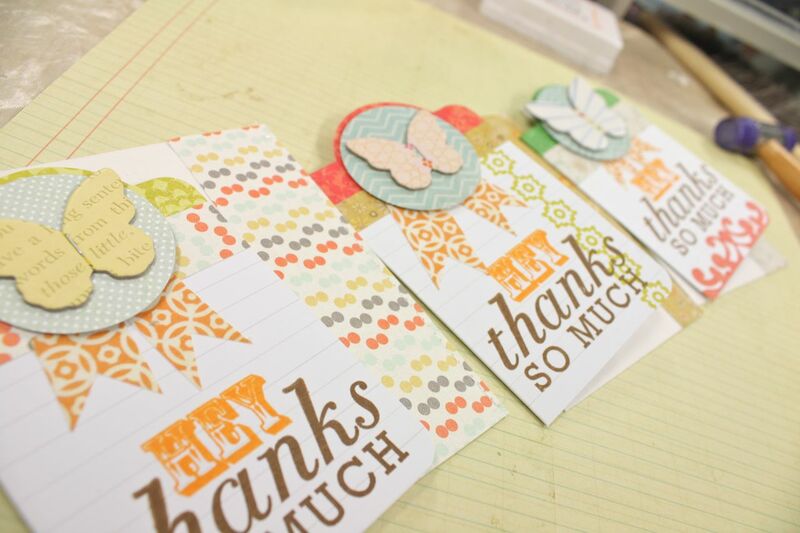 I also used the new Front & Center #1 die. Our assignment was to create a tag & card using a combination of both the new sets. 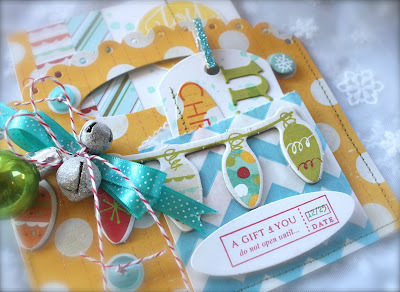 I used all the products to create a tag and card with coordinating pocket.....all within one project. The patterned papers are from Crate Paper's 2010 holiday collection. Let me show you a break down of all the pieces and parts. 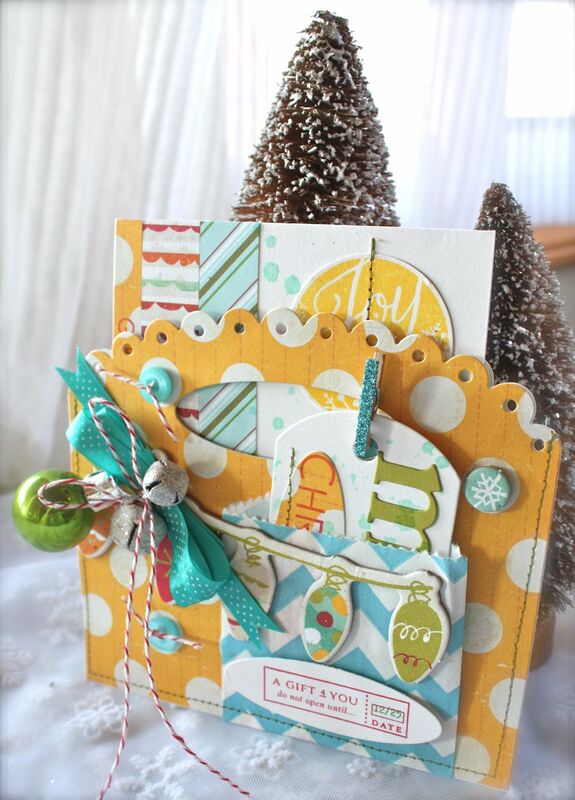 First up I created a pocket to hold an A2 size card using the Front & Center #1 die. I'm telling you, I love this die and I know you will too. I die cut two pieces of the yellow polka dot patterned paper, trimmed off the bottom and then stitched around three sides to create a pocket. 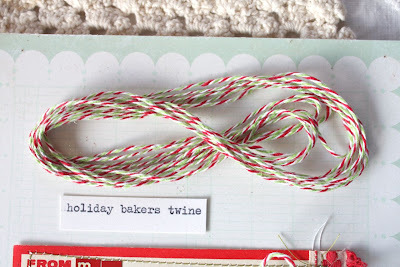 I embellished the card pocket with a bundle of loopy ribbon, jingle bells, a green ornament and red and white baker's twine. 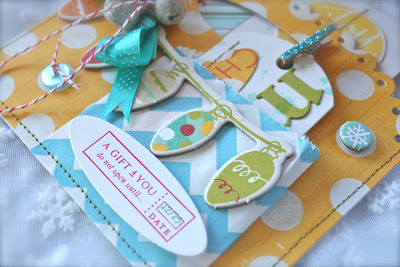 Here's the tag portion of my project made from the Tag Sale #5 five, another new favorite die of mine. I topped it with a *merry* die cut word from the Wonderful Words: Holiday die collection. 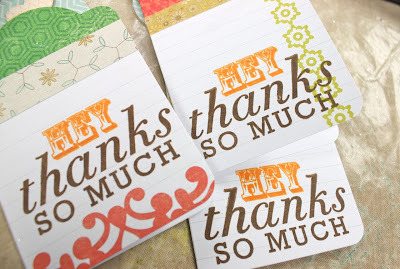 I saved the die cut oval that comes from the main Front & Center #1 die. It's the perfect little accent to add a stamped word to. 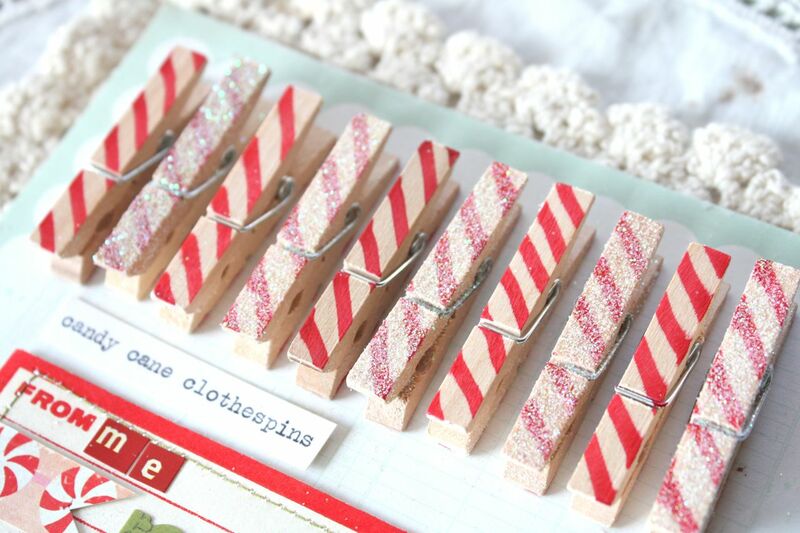 A glittered clothespin was added for some bling along with some machine stitching. Another fun accent on my card pocket is a second pocket made from an Aqua Chevron Bag from my shop. I adhered it to the pocket front before stitching, trimmed about 1" off and then did my stitching. 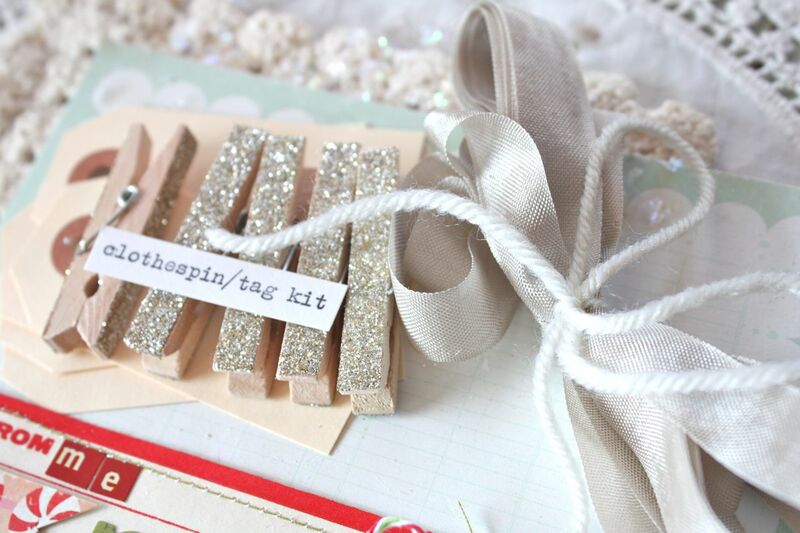 I love the pocket on top of a pocket...so many fun places to tuck in little tags. I used another oval on the bag front with a stamped holiday image. And here is my simple card that slips into the card pocket. 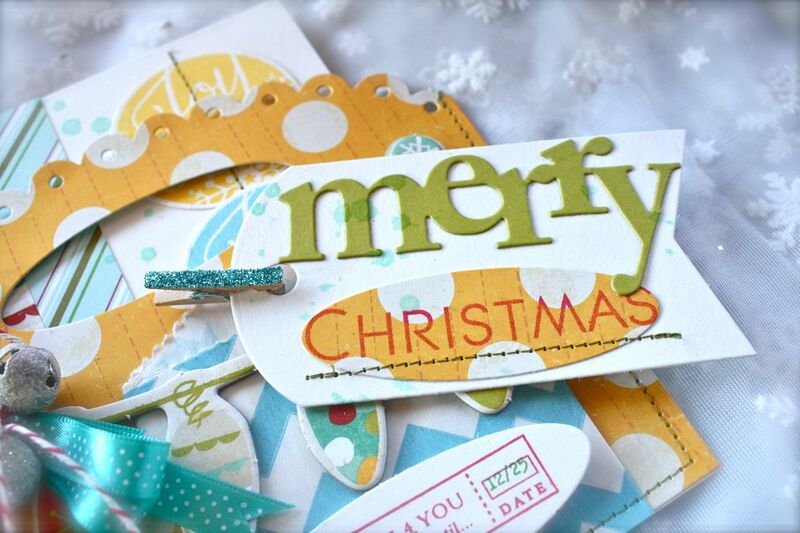 It's made up of 3 stamped tags from the 2011 Holiday Tags stamp set, with stitching on two of the tags. All of my little pieces make a perfect little gift because you have a card + a tag + a gift pocket all in one. Add in a gift card, a candy bar or some other fairly flat goody and you're good to go. Hope you enjoy!! I think we'll make up a bunch of these for the girls' friends at school....or maybe teacher gifts. They're just so fun to make! Please visit the rest of the Papertrey team to see their creative takes on today's featured products.